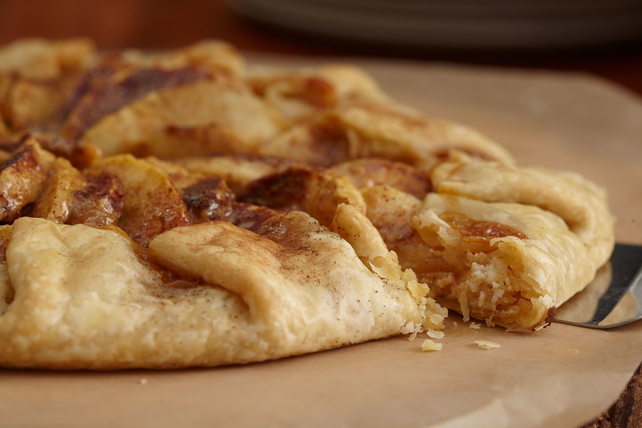 Enjoy an Easy Free-Form Caramel Apple Pie tonight! This rustic caramel apple pie dessert can be savored at a fancy B&B or made at home in under an hour. Microwave caramels and milk in medium microwaveable bowl on HIGH 2 min. or until caramels are completely melted, stirring after each minute. Cool 5 min. Meanwhile, unroll pie crust on parchment-covered baking sheet; roll into 12-inch round. Spread cream cheese onto pie crust to within 2 inches of edge; drizzle with 1/2 the caramel sauce. Arrange apple slices over crust, overlapping as needed to form even layer. Dot with butter; drizzle with remaining caramel sauce. Fold edge of pastry over apples, leaving center uncovered. Sprinkle with cinnamon. Bake 25 to 30 min. or until apples are tender and crust is golden brown. Cool completely. Check pie after 20 min. If the crust is becoming too brown, cover the edge loosely with foil for the remainder of the baking time. One serving of this warm fruit tart makes a nice dessert for a crisp fall night. Apples that are good for both cooking and eating raw are called all-purpose apples. Varieties include Braeburn, Cortland, Empire, Granny Smith, Honeycrisp, Jonagold, Jonathan, McIntosh, Northern Spy and Winesap.